very useful information 🙂 My son is one month old and I’m struggling with this. especially now that it’s getting warmer. Do you use a sheet and blanket in addition to the sleepsack? How many togs do I count for the blanket and sheet? I struggle with getting my kids temperature right this time of year as well! For young babies, I avoid using blankets because of the suffocation hazard. Just the sleep sack is ideal. 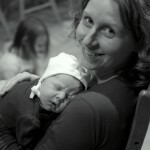 Probably the most important takeaway is to adjust based on how cool or warm your baby seems at night. Cool hands are ok, icy hands or cold feet is an indication of too cool. A thin layer of cotton is approximately 0.5 tog. A thicker layer might be closer to 1.0 tog. Instead of a sheet, you might try an undershirt, or perhaps instead of a cotton sleeper, maybe a fleece sleeper. Would a fleece footed sleeper have the same tog rating as a fleece sleep sack? Hi Katie, thanks for the question. My best guess is that they’d be similar. Thank you for this article. I’ll be having my first baby in a few weeks. Hubby and I typically keep our apartment between 60-65 F at night. The chart confused me a bit so I wanted to get some clarity on how I should be dressing my newborn for the first few months. We live in Texas. Congratulations Jessica! Check out the 2nd or 3rd line up from the bottom if the nursery temperature is between 60 and 65 F. And of course, gauge how cool baby seems. Hands which are cool to the touch are ok – but not icy. All the best to you! I was just wondering how to tell if the baby is to warm? I am generally cold so I bundle up all the time and I’m concerned that my baby (5 days old) is to warm because I bundle her too much since I’m generally cold? Hi Becky! Congratulations! Generally cooler is better as overheating is a risk factor related to SIDS. Genearlly, for newborns, look at what you’re comfortable in, and add one more light layer for babies. Check her hands, feet and back of the neck for any indication that she’s too cool or too warm. All the best Mama! This will come in very handy since i’m due in about a week and a half! Can you explain the tog thing to me? I know its a weird unit for thermal resistance, but this chart has so many togs PLUS the clothing listed….so what are the togs? Hi Liz! So togs are a measure of thermal resistance, or effectively, a warmth rating. The higher the tog rating, the warmer the item. Generally, think of 1 tog as about 1 layer of cotton (an undershirt would likely gain you 0.5 to 1 tog). The chart is aiming to correlate the number of togs needed to stay warm within the related temperature. Does that answer your question? So for the 69-70 degree level you need an undershirt or something light, plus the sleeper and onesie? I keep it around 65 at night…we sleep better cool but I’m always afraid my little one might be cold. I in return dress her for sleep in a cotton sleeper & a cotton swaddle for the first bit of sleep and as it gets colder during her first diaper change I switch it out to a fleece halo sleep sack swaddle or sooner if it’s cold. Is this okay since it’s fleece or do I need an additional shirt under the sleeper? So quick question for 69-79 degrees would you do onesie, cotton sleeper and fleece sleep sack? During the winter I am confused if the pjs should be cotton or fleece in a 70 degree room. Thanks for your information, I have a one Year old baby… She moves a lot when she sleeps, and I can’t use a sleeper… Her room normally is At 21 degrees Celsius how should I dress her ? Wondering if a winter weight sleep sack with a long sleeve cotton onesie (just sleeves, no legs) is fine? He was in a regular cotton sleep sack with cotton pjs but his hands were pretty cold. I’m struggling with getting the right outfits for different temperatures too… do you have any suggestions? Thank you so much for providing this information! I found it very helpful! Just to clarify, do the pajamas that begin appearing in the 3rd row cover the feet or no? Hi Dominique, feet covered in that sleeper 🙂 If you have a footless sleeper, you can use socks. 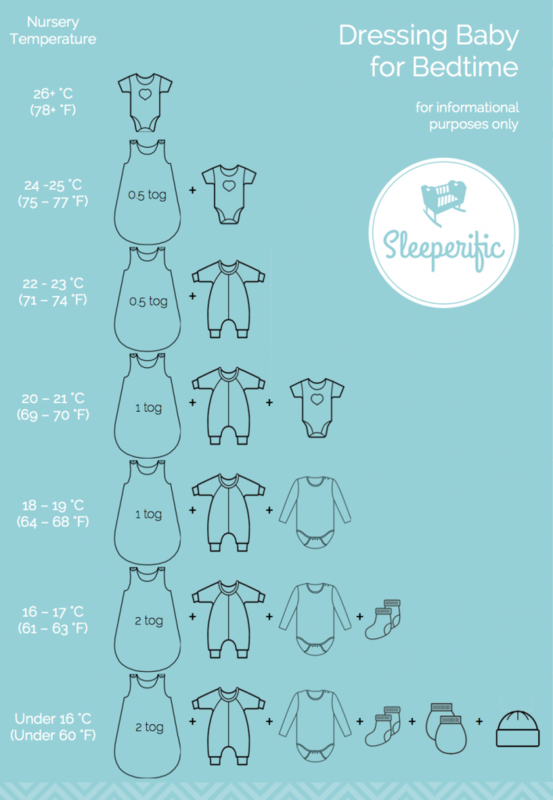 Anyone wondering about the ‘Tog’ system, Kyte Baby (https://store.kytebaby.com/collections/sleepsacks) designs their sleep sacks with the tog system. So you can be sure to know where you stand according to the chart and ensuring your baby is warm and safe. They are a little bit more expensive, but are so soft and worth the peace of mind. Our room is dipping down to 17 degrees Celsius and I was wondering if you would put a fleece sleeper on with a fleece sleep sack? If I did this I wouldn’t put any more layers on .. or should I put a cotton sleeper with a fleece sleep sack (or vice versa)? Hi Alexandra! That’s chilly for sure. If baby has chilly feet or icy hands (hands which are cool to the touch), experiment with warmer layers or another thin layer (like a cotton undershirt). All the best! And this chart can be followed year round right? Like, it doesn’t matter if you’re AC is on during summer or heat during winter..just go off the room temp? Hi Tanya, for the most part, yes! In humid places, you may find that you need to adjust for less layers. My baby is 13 days old and our house doesn’t hold heat well. I’ve been having him sleep in a fleece sleeper which has mittens and footies built in and helps avoid him scratching his face. I’ve also been keeping a hat on him, he doesn’t seem to be uncomfortable or sweaty behind his neck but I was wondering if I should leave the hat off. Our house is typically between 68-73 degrees but has gotten down to 63 on really cold nights.